Yes, we know what you’re thinking. Here comes another cookie recipe. Just like the other thousand you’ve already seen in the past week. Because we all know, this time of year, it’s impossible to get away from them. They’re in the office, they’re at home, on Facebook, at your neighbor’s holiday party, at the physical therapy office, even at the gym! So, if you’re sick of them by now, we don’t blame you. So we won’t be bombarding you with cookie recipes, promise. But, we had to share at least one. 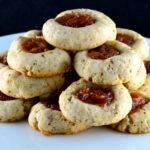 And what better than a vegan version of a classic, like thumbprint cookies? 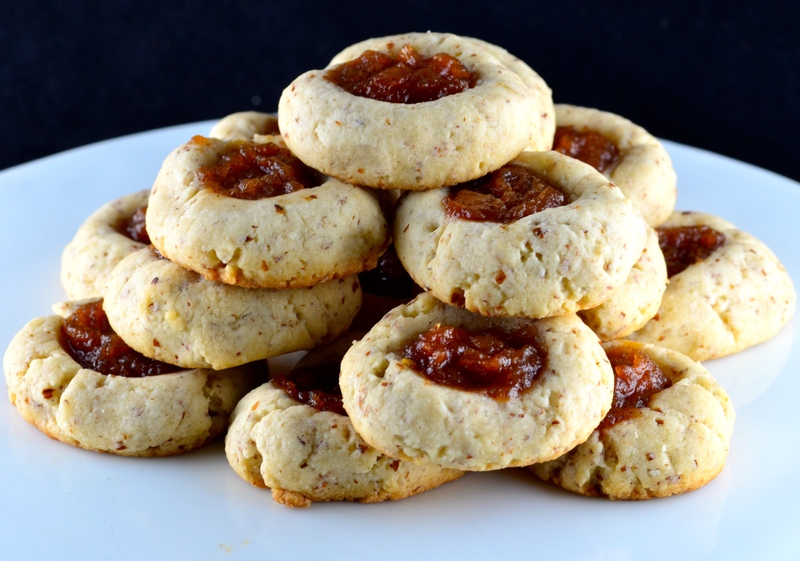 Here’s a little confession though: we’ve never made thumbprint cookies before. And we’ve only had them once or twice. But they’re fun, and pretty. And quite frankly we were looking for an excuse to use our delicious spiced pear jam recipe! Creating vegan recipes, especially when it comes to baking, can definitely be a challenge. And as you probably know by now, it is also one of our favorite things to do. It’s all about chemistry. It’s all about getting to know your ingredients, what they do and how they “behave”. One of the main reasons you will often see us use the same ingredients and even specific brands over and over. Because we know they work. Cookie recipes can be tricky though. Getting the right dough consistency is extremely important so again, you really need to know your ingredients to achieve that. Whenever possible, even when making indulgent treats, we try to make them at least a little bit healthier than their traditional counterparts. That doesn’t mean they’re completely guilt free, but every little bit helps, right? So in this case, we added texture and richness by making a couple of substitutions: we swapped some of the regular flour for almond meal; and substituted half of the amount of coconut oil for GO Veggie! dairy free cream cheese alternative. A great way to achieve the perfect consistency but keeping it dairy and cholesterol free, lower in saturated fat and of course, vegan! We tested this recipe several times using different ovens. For each oven, the baking time changed. Keep an eye on the cookies after 15 minutes, to make sure they don’t burn on the bottom. They should be slightly soft when done. This post was sponsored by GO Veggie! . Thank you for supporting the brands that support May I Have That Recipe. All the opinions are our own. 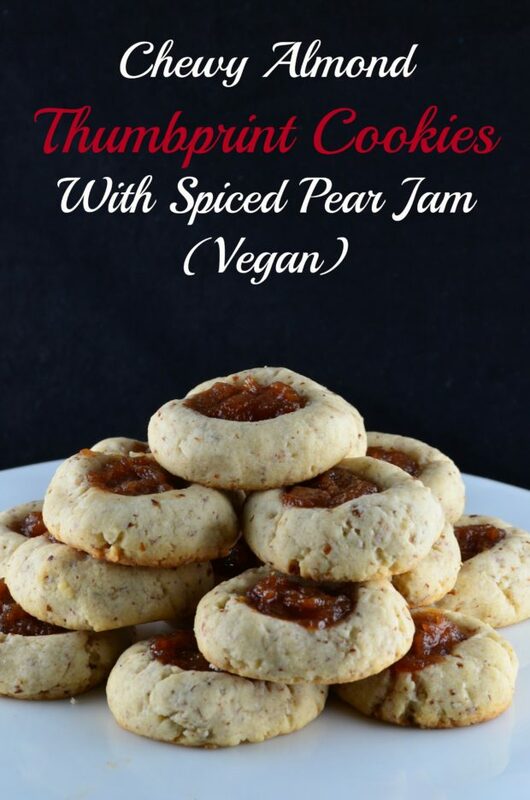 this looks delicious, always trying to find vegan cookies. I’m so happy I stumbled across your blog from the Finding Vegan link up! I was beginning to think I was the only lebanese blogger out there haha. 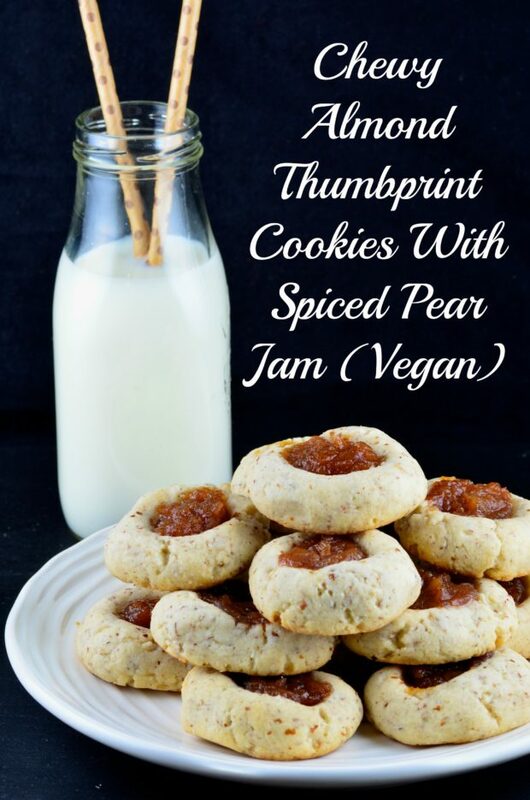 Thumbprints are one of my favorite classic recipes and I love your addition of vegan cream cheese. That has to make the texture amazing! Thank you Consuelo. 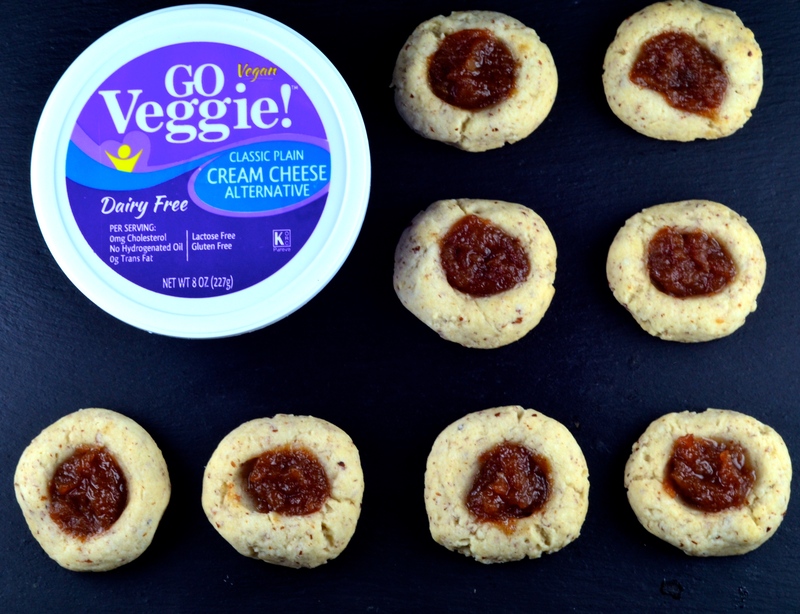 We love cookies too, and if they are vegan even better! This is the second time I have tried this recipe because they look and taste so good. But both times now my cookies come out flat as a pancake. While in your picture they are round and puffy. I noticed there is no baking powder or soda in the recipe. I followed it as written any suggestions? My family eats them flat because they taste so good but I would like to make them for my gluten free friends and would like to have them look good!! We’ve tested this recipe several times and it has worked fine so far. If you’re using the exact amounts of coconut oil and cream cheese, the recipe should work. Maybe double check the size of the cookies when you roll the dough? You could also try to refrigerate them for 20 minutes before baking. Also, we noticed you mentioned you wanted to make them for your gluten free friends. Please keep in mind these are not gluten free, since they contain all purpose flour. Hope this helps. Any more questions please let us know!